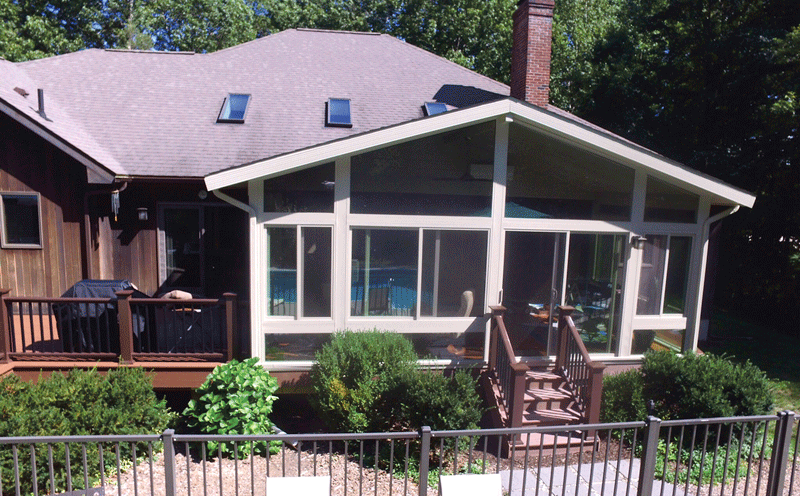 A sunroom built by Vista Home Improvement. Brian Rudd parlayed 14 years of experience with his father’s large home-improvement company into his own small firm in 2008 — one he has grown into one of the larger players on the regional landscape. But that growth, he insists, has been measured and smart, because he doesn’t want to lose the emphasis on customer service that continues to drive impressive repeat and referral business. Brian Rudd graduated from college with a degree in accounting, but spent about six months in that field before deciding he’d rather work for his father’s company, Patriot Home Improvement. That was in 1994, and he worked his way up to operations manager in that organization before the elder Rudd began contemplating retirement. Brian made an offer to buy the business, but his father didn’t take it — so he struck out on his own. “I learned a lot about what to do and what not to do” during his years at Patriot, he said, but when he launched Vista Home Improvement in a second-floor apartment in 2008, he didn’t realize he’d soon be staring into the teeth of a global financial crisis and resulting recession. “We didn’t think about the economic landscape; we thought about what we wanted to accomplish,” Rudd told BusinessWest, adding that the company’s small size — he did $319,000 in business his first year — was actually a benefit during a time when larger companies were struggling to keep their large crews busy. In other words, he earned enough business to survive and grow, one customer at a time. 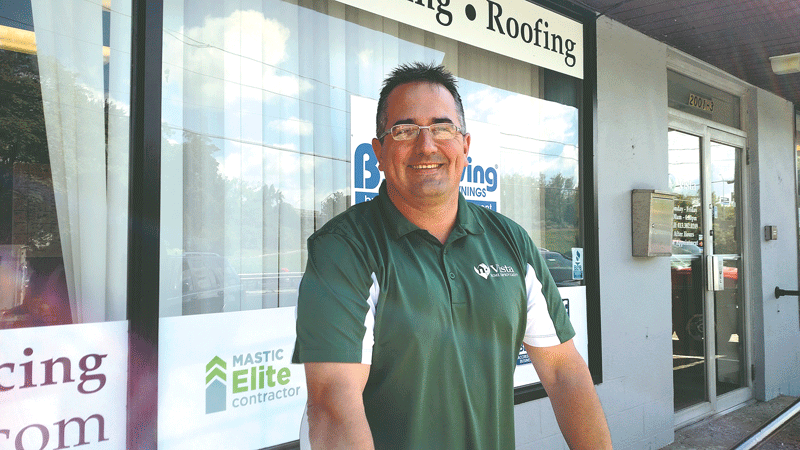 Starting with a focus on siding, windows, and roofing, Rudd hung up a shingle on Elm Street in West Springfield soon after, then moved to Vista’s current location on Riverdale Street three years ago — a space he’s already outgrowing, with 26 full-time employees and 24 more installers in the field. Last year, the company did $6 million in sales. Brian Rudd says smart growth — not taking on more than the company could handle without losing its personal touch — has been a successful philosophy. Weekends saw him at home shows, flea markets, and other events, soliciting for appointments, and then it was back to work early Monday morning for another non-stop week. But by doing so much himself in the early days, he was able to hone a customer-service philosophy he says has always driven his business. Rudd knew he wanted to forge a more intimate, person-to-person model of business than his father’s large firm, so he has grown gradually, never taking on more than he could handle without losing that service-oriented touch. 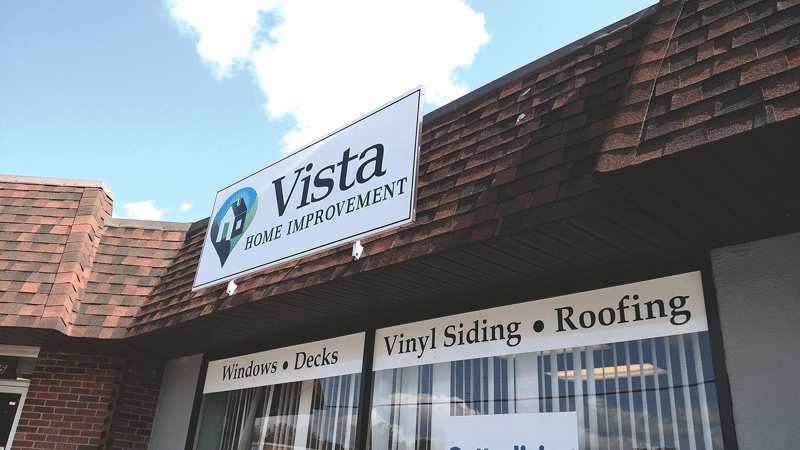 Today, Vista specializes in all types of exterior remodeling — custom doors and entryways, windows, awnings, decks, gutters, and sunrooms in addition to roofing and siding projects — but also installs bath and shower systems. “We got into bathroom systems because, in the wintertime, when it’s cold, we want to keep working,” he said, adding that Vista has become one of the top dealers for its manufacturer of choice, Luxury Bath Technologies. It’s a good niche to be in, he noted, because, while many homeowners enjoy tackling DIY projects around the house, they’re often loath to look behind the tiled walls of their bathroom and deal with issues of mold, poor plumbing, and other problems that might arise. Rudd recalled someone he knows who started a bathroom remodel on his own and still isn’t done six months later. For instance, Vista is one of about 200 Owens Corning platinum preferred contractors. As part of that program, the installers attend annual trainings, and each project is factory-inspected by Owens Corning when done, so the manufacturer knows the roof is installed to the correct specifications. Vista’s headquarters on Riverdale Street is its third home in a decade, and the company is already threatening to outgrow the space. But at the end of the day, Rudd says Vista has grown because of the way customers and employees are treated. “It’s all about customer service,” he told BusinessWest. “To me, the number-one person in the company isn’t me; it’s my employees. If you treat the employees like they’re number one, they’ll treat the customers like they’re number one, and that’s how it works here. The accolades speak for themselves — Super Service Awards from Angie’s List the past six years, an ‘A’ rating with the Better Business Bureau, and the aforementioned platinum status with Owens Corning, to name a few. While always looking to expand on the company’s product lines, Rudd said he won’t take on work he’s not accustomed to doing just to get a contract. But he said the region’s remodeling companies form a tight network, and will refer customers to each other. In fact, one hindrance to growth is the ever-present challenge of finding quality employees at a time when the trades are struggling to attract young talent. Rudd wants to go beyond that, and has a goal of making Vista an employee-owned firm, with profit sharing, within five years — which would help the company become even more of an employer of choice. Meanwhile, he’ll keep his boots on the ground as much as he can, in between managing the day-to-day affairs of a company that is a far cry from its humble beginnings in a small apartment at the start of the Great Recession.